Grades 3 - 8. This book was written to help students learn Place Value, Chance, Probability, Data Management and Organization (including graphing), Multiplication Facts, Multi Operations and Multi-Digit Operations, as well as Fractions, Decimals and Percents. 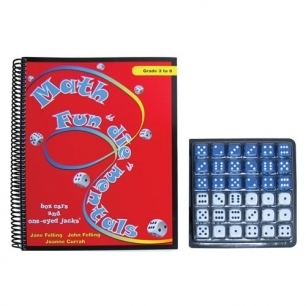 Over 40 games and activities, many of which have follow up questions for Math Journal writing and responses. Each section begins with extensive teaching tips, helping teachers make the most of this innovative resource. Includes book and tray.